This was the fourth time I’ve seen support act Tristan MacKay in three years and while the one time busker; originally from Devon is very good; especially his guitar playing, he needs some new stories as I now appear to know them all word for word. First song Love is a Game was very pleasant and got the evening off to an interesting start; and later Wherever You Lay Your Head really stood out, getting a long and loud reception from the largish audience. The bar area was interesting between sets, as the predominantly male crowd (all of a certain age) seemed unnaturally excitable at the prospect of seeing their ‘hero’ in such an intimate setting; following the reunion with the Rumour eighteen months ago and a return to the area at a packed Academy a year ago. 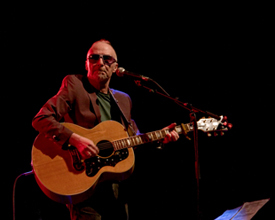 Appearing alongside the legendary Brinsley Schwarz on Les Paul, and wearing a brown sports coat over a t-shirt (which he later referred to a ‘retro cool’) and his trademark huge sunglasses, Parker opened with a walking pace version of Watch the Moon Come down; which set the tone for the evening. Following a self-imposed 20 year exile in the Americas Graham Parker is no longer the Angry Young Man he was when he left these shores and tonight he was on top form chatting in between songs and even laughing at his own jokes. With his new album coming out in May, I was surprised that only three of those songs were included and none from last year’s Thee Chords Good, but with a canon of work like his there were still a lot of songs to choose from. The core of the set was based around his debut album, Howlin’ Wind which was released in 1976……….nearly FORTY YEARS AGO! Of these songs Between You and Me (with ironic Dylanessque harmonica solo), Silly Thing and White Honey with its sing along chorus all sounded as if they were 45’s played at 33 1/3 still sounded as fresh as they day they were recorded. In a night chock full of surprises, songs were included from Imaginary Television, Mona Lisa’s Sister and even The Real Macaw which all went to visibly thrill just about everyone sitting around me (and me too). Although much of Parker’s mid-life solo career will have passed by the majority of the audience, the mere mention of the Your Country album received a muted cheer of recognition and the choice of Nation of Shopkeepers was outstanding and soon had everyone bellowing out the dip-dip-doo chorus with passion. One song that was included, which I’d totally forgot about was England’s Latest Clown from Don’t Tell Columbus and it was fabulous; really highlighting GP’s distinctive style of singing. Following a humorous intro from Brinsley the duo cranked up the volume on Passion is No Ordinary Word; and halfway through Graham snapped a string on his electric guitar; but being the Pro he is, carried on regardless. Tonight there weren’t any guitar techs in the wings so Parker had to busk the final six songs on an acoustic guitar; making up arrangements on the hoof; which is why I absolutely love live music. The first ‘experiment’ was another song from Howlin’ Wind; and a personal favourite – Back to Schooldays and this arrangement was electric; in an acoustic fashion! After a quick whispered conversation Stick To Me carried a reggae vibe with Brinsley’s playing sounding not unlike early Peter Tosh in places. The singer with his freshly coiffured silver Tintin quiff broke out into a huge smile when the crowd recognised the opening riff from the magnificent Hey Lord Don’t Ask Me Questions which ended the concert; or did it? It was no surprise to anyone when the duo quickly returned to blast through the new single Railroad Spikes, the rarity Nothing Pleases Me which was desperate for Bob Andrews on upright piano, your favourite, and mine the song that made me fall in love with Graham Parker’s music – Hold Back The Night and then everyone went home with a huge smile on their faces. What more can you ask for from a night out?